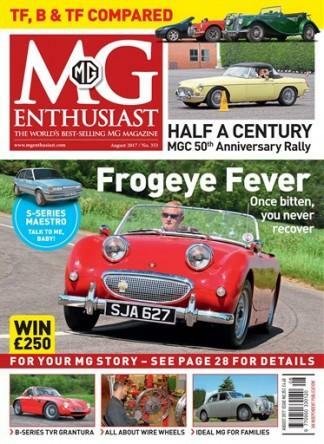 A MG Enthusiast magazine subscription features the long-established make-specific publication dedicated to all MGs, covering all examples, from pre-war TFs, to the more familiar shapes, including the Midget and the ubiquitous MGB; and not forgetting the more contemporary mid-engined MGF. MG Enthusiast magazine features over 100 pages which are packed with popular articles aimed at MG aficionados the world over. Featuring the latest news from the scene, the very best cars, buying guides, road tests, show reports, exclusive archives, motorsport and practical advice, it's the definitive read for fans of this popular British marque. Regular features of MG Enthusiast magazine include- The Peter Welch collection - A rare look at this stunning collection of MGs. Tribute to Phil Hill - The fastest man ever in an MG, this is our tribute to the American legend who passed away this month. The MG Magnette Story - Stunning new photography and the story of how one of MG's greatest sporting saloons emerged. Roger Parker and the MGOC technical team have been solving your problems in our Technical Helpdesk. Also in our Technical section: MGF/TF AIR DUCT KIT - A cheap and simple way of helping a hard-worked MGF or TF engine to keep its cool and the BUYERS GUIDE for the MGA. Be the first person to tell us what you think about MG Enthusiast (UK) and you'll save $5 on your next purchase!